This property, while in the country, is still close to many interesting activities. The house is conveniently located near Johnstown, Altoona, Bedford and State College. The guest house is just 10 minutes off the turnpike. There are brochures in the guest house for information on local places to visit. The brochures will direct guests to everything from spa's, shopping, antiques, bike trails, museums, covered bridges, hiking, skiing, and so much more. I have been a life long antique and folk art collector as well as a shop keeper for over 25 years. The guest house showcases all that I love, antiques, folk art, quality reproductions coupled with my commitment to provide all the comforts of home. One of our guests wrote "the house is a great respite to decompress from the daily grind, sitting on the back porch listening to the birds sing." This three bedroom house is on a 144 acre farm that is rich with history. 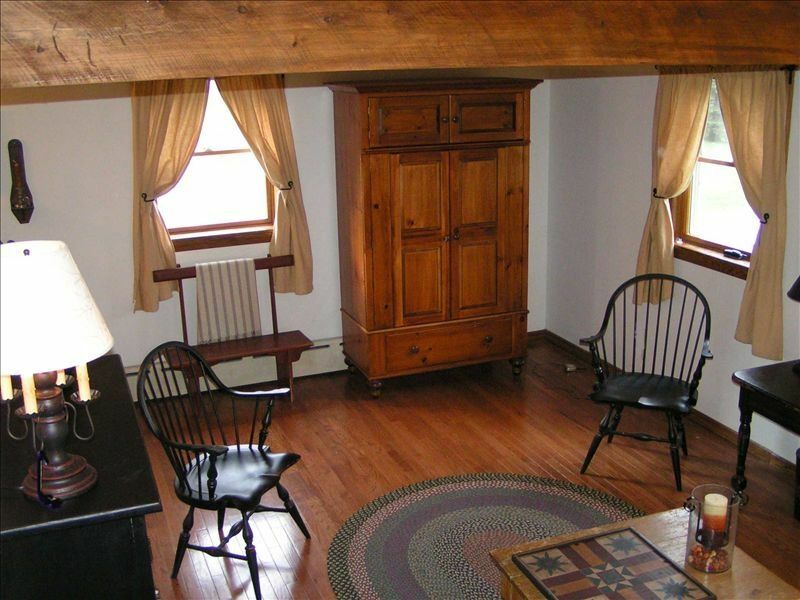 The Spring Meadow farm was deeded in 1796 and the earliest owners were Quakers. Some of the Quakers that lived on this farm were involved in the underground railroad. Another interesting fact is just before the civil war President Buchanan would visit here. In the 1880's senator John M. Reynolds bought the farm at a sheriff sale. He had the road paved between the barn and the train station so he would have a smooth horse and buggy ride when he needed to head to Washington. It was the only paved road in the entire county. That is a sampling of the history here. The guest house is nestled between the 1840's house and the barn. Come sit on the screened in back porch and sip coffee, tea, or drink of choice and enjoy the scenic views and the wildlife (birds, ground hogs, and deer). In the evenings you can grill out on the porch, swing in the hammock,or have a bon-fire. We also provide 2 cannondale bikes for your use. A great place to unwind with all the amenities of home. We have hosted reunions, birthdays, quiet getaways and even weddings. Rent our Guest House and revisit life in simpler times. Try a women's weekend! I have had many groups of women who have come and enjoyed a girls weekend. Some shopped, some cooked, some did crafts, some just enjoyed chatting with their friends, some have had a wine tasting party, and some have celebrated birthdays. No matter what they came to do, they all have enjoyed this guest house. Many are planning return visits. You can't go wrong spending a weekend with your girlfriends. Downtown Bedford is 12 minutes away. Pa turnpike is 10 minutes away. Skiing, hiking, swimming at Blue knob 15 minutes away. Omni Bedford Springs 15 minutes away. The kitchen is fully equipped in order to make any meal. There is also a gas grill and a charcoal grill if you prefer to cook outside. Very large lawn and grounds. Lawn games available. Located on a historic 144 acre farm, antique and gift shop located on property. Nearby covered bridges, lots of bike trails, fishing nearby, close to two state parks Blue Knob and Shawnnee Park (fishing, boating, and skiing). My sister and I and our daughters enjoyed a lovely time in the Bedford area for a few days. We stayed here and had a lovely time! The accomodations were exactly what we were looking for and we would definitely stay here again! Very cozy and yet large enough to accomodate us. And we loved the decor of the house! Very clean and well maintained. Nice quiet setting. We stayed here in late January for my husband's birthday celebration ski/snowboard weekend. A few of our close family and friends joined us and we were all pleased with this charming house and found it to be inviting and comfortable. Liza is a very thoughtful host and made sure we knew we could go to her if we needed any assistance (we didn't need any help, as everything was is good working order) yet she also made sure we had privacy. It's a quick drive to Blue Knob ski resort. I highly recommend this place to anyone who is looking for a place in the area! Thank you for the kind words and the good review. I was hoping that you would get to ski, the weather hasn’t been to good for skiing. I am glad you enjoyed your stay in our simple country home. You are welcome back anytime. We really enjoyed our stay at this rental property. The owner has done such a nice job decorating the guest house. The screened in porch provided the perfect setting for socializing at night and had beautiful views in the morning. I will stay the most important thing about this rental is that it was very clean and the beds were very comfortable. We will hopefully be back. Thank you for your kind words, I couldn't be happier with the things you said. I am glad you enjoyed your stay and hope you can come again. We really appreciate you choosing Spring Meadow Guest House for you get away. We had a wonderful time staying in Liza's cabin. She has clearly spent a lot of time making it a cozy and welcoming place. She has thought of everything. The kitchen is very well stocked, there are movies, board games, bath robes, plenty of towels, and endless personal touches throughout. It was the perfect spot for a weekend with friends and only a short drive to the Blue Knob ski resort. Would definitely consider staying here again. Seems like it would make a great home base during the spring and summer as well. Tastefully appointed guest home with early American decor. Lovely country setting. Bedford (restaurants, shops, etc.) are only 15 minutes away and Flight 93 Memorial is a lovely 30 minute drive though the mountains. Only thing that could have made it better would be central air (vs. window a/c & fans) and more clarity on the "smart" TV. I recommend to our guests to try and visit some of the things listed here.Omni Bedford Springs Spa, The Coverlet museum, Old Bedford Village, The Fort Museum, Antique shopping, Johnstown Flood museum and Heritage museum, Shawnee Park, Blue Knob Park, Lakemont Amusement Park, DelGrosso Amusement Park, Altoona Curve baseball, Frank LLoyd Wright's Falling Waters, & more. There are many things to do within driving distance. Or many guests opt to just relax at the house play yard games and have evening bonfires.